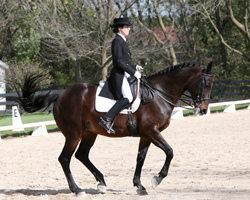 Janna has had the privilage to study with some of the world's top classical dressage trainers. A protegé of Hans Rieger, chief rider at the Spanish Riding School in Vienna, Janna began working as an apprentice for Herr Riegler in 1997 at his private stables in Austria, and has continued to train with him regularly since then. She has also studied in Switzerland with Herr Riegler's own mentor, Georg Wahl, and Herr Wahl's protegé Christine Stückelberger, six-time Olympian and individual gold medalist. In the upper midwest, Janna has studied with several noted FEI riders, including her first mentor, Anne McKay. She also regularly attends clinics with internationally reputed clinicians, as well as hosts clinics with Herr Riegler in MN. Since 2000, when Janna graduated from Macalester College with degrees in German and Music, she has provided dressage lessons and training in a variety of settings. During four years of graduate school at the Eastman School of Music in New York, she helped establish a dressage training program at a Swedish Warmblood breeding farm, and worked as an assistant trainer to FEI rider Debbie Lockemeyer, as well as working with private clients. Additionally, she made several trips to Austria to train with Herr Riegler during these years, including a whole year spent there in 2005-06. Janna returned to her native Minnesota in 2006, where she now resides and trains a dedicated group of riders and horses. In 2008 she purchased the Dutch Warmblood mare Godiva, then already 19 years old, and trained and competed her through the FEI levels all the way to a Grand Prix debut when Godiva was 23 years old! While earning her USDF silver medal and part of a gold, Janna demonstrated that classical methods can really keep a horse sound and performing enthusiastically, even at the highest levels, up to an advanced age. Janna also holds the USDF bronze medal award in addition to the silver, earned on horses that she trained and showed for her clients, and has coached students towards their own bronze and silver medals. Currently training out of Majestic Pines Farm, a premier boarding facility in Afton, MN, Janna is also a regular clinician and instructor at several stables around the Twin Cities.